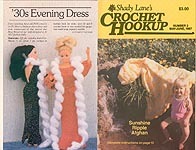 Crochet Hookup was a digest- size magazine published by Shady Lane (popular crochet designer Carol Hegar) in the 1980's. 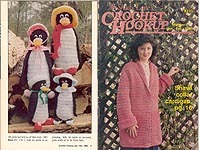 Shady Lane's Crochet Hookup #3, May- June 1987. 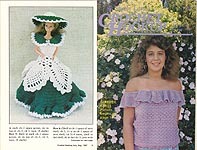 Designs include: Fashion Doll 1930's Evening Dress, Pinepple Doily, Blooming Tissues bathroom tissue cover, Slices of Florida Potholders (Lemon, Lime, Orange, Grapefruit), Sunshine Ripple Afghan, Shell Shawl, Sunshine Ripple Pillow, Butterfly Applique. Excellent condition. Shady Lane's Crochet Hookup #4, Jul- Aug 1987. Designs include: Fashion Doll Southern Pineapple Dress, Two LIttle Mice Kids, Plaids & Stripes Pillow, Flower Tissue Roll Cover, Plaids & Stripes Afghan, Summer Shell, Violets Table Ensemble, Heirloom Tablecloth, Pretty Petal Plant Hanger. May have crunched corner on back cover, but otherwise excellent condition. Shady Lane's Crochet Hookup #5, Sept - Oct 1987. 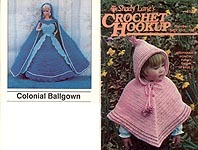 Designs include: Fashion Doll Colonial Ballgown, Ski Hat & Mittens, Three Picture Potholders (Lighthouse, Mushroom, Sailboat), Flower Pillow, Rose Garden Afghan & Slippers, Quick & Easy Poncho. Pink highlighting on three lines of one pattern, but otherwise very good condition. 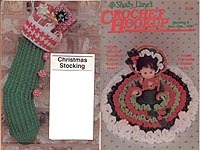 Shady Lane's Crochet Hookup #6, Nov - Dec 1987. Designs include: Holly Bed Doll Ensemble, Hat & Mittens Lapel Pin, Gingerbread Man Ornament, Christmas Stocking, Mr. Snowman, Snowflake Ornament, Poinsettia Afghan, Holiday Kitchen Towel Topper & Potholder Set, Giant Snowflake. Excellent condition. Shady Lane's Crochet Hookup #7, Jan - Feb 1988. Designs include: Penguin Family, Tiger Hat & Mittens, Petal Pillow, Heart Doily, Shawl Collar Cardigan, Cotton Candy Afghan, Kitchen Oranges Towel Topper & Fridgie, Hooded Baby Sweater. 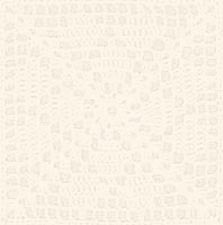 Stain on one page, small marks to keep track of rows on another. Otherwise, very good condition. Shady Lane's Crochet Hookup #8, Mar - Apr 1988. 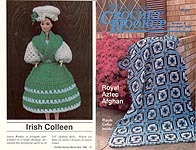 Designs include: Irish Colleen Fashion Doll Outfit, Royal Aztec Afghan, Mr. Mischief Finger Puppet, Ripple Collar, Petite Peony Pillow, Crocheted Cross Stitch Blender and Toaster Covers, Baby Ensemble. Excellent condition.